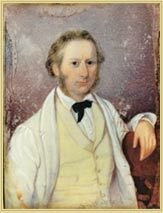 George Wyndham (1801-1870), pioneer farmer, pastoralist and vigneron was born at Dinton House, Wiltshire, into an old and prominent English landowning family. Educated at Harrow and Cambridge with a view to taking a living in the Church (of England) held by the family, he preferred to make his own way in the world. In 1826 he went to Canada to investigate at the possibility of acquiring land on which to settle. He travelled with John Galt, the prominent Scottish novelist and lobbyist, who had been appointed a member of the British Government's Commission of Inquiry, to establish the price for one million acres of land to be acquired for development by the Canada Company. When Inquiry Commissioner John Galt became Secretary of the Canada Company, he founded Guelph in 1827, naming the main street Wyndham in honour of George. Following his marriage to Margaret Jay in 1827, and his refusal of a Government position, he decided to emigrate to New South Wales as the Colonial Office was offering a free grant of 640 acres (260 hectares) for every £500 ($1000) of capital, with a maximum of 2560 acres (1040 hectares). George and Margaret arrived in Sydney on Christmas Eve 1827 on the "George Home" with several servants, cattle, sheep, horses, pigs, hounds, goods and chattels. He purchased 2080 acres (842 hectares) at Branxton in January 1828 and renamed it Dalwood after one of his father's farms at Dinton. Construction of the house was commenced in 1829 or possibly 1828. The purchase of adjoining land, a Grant and lease at Merriwa, and the taking up of land under licence at Collyblu on the Liverpool Plains, Bukkulla and Nullamanna near Inverell and Keelgyrah on the Richmond River enabled George to expand his pastoral activities over some 200,000 acres or 1,284 square miles (80,937 hectares). 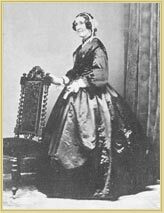 Margaret married George at the Ambassador's Chapel, Brussels, 26th April, 1827 and died 3rd September, 1870. They met in Rome on Christmas Day 1825 when she was with a party of friends which included one of George's neighbours. George was recuperating from a bout of fever after returning from Malta. Before leaving Italy they were engaged, subject to her father's consent. Margaret's father, John Jay, was descended from a Huguenot family which fled France to Edinburgh after the Revocation of the Edict of Nantes in 1685. Her mother, Helen Livingston, was Scottish and died while Margaret was young. Following trading losses during the Napoleonic Wars her father conducted a school for English boys in Brussels. Margaret was educated in England. She also spoke fluent French and Italian and was an accomplished pianist. Margaret had 14 children, losing only one to ‘Colonial Fever’ (thought to be malaria) and one at birth. She taught herself to bring up her family and to run a large establishment. She kept a notebook in which she recorded cases of illness, doses of medicine, treatment, food, etc. A typical entry was: "Child in high fever, never closed its eyes; a dreadful night, like a continuous nightmare; great thirst, no appetite; lips black and skin cracked; tongue furred; weather unusually hot. Gave two grains of calomel." After several weeks of similar entries, she wrote: "The medicines have restored the babe, God be praised, but I myself am worn to a shadow." George Wyndham's purchase of Dalwood also brought with it immediate responsibility for the feeding, clothing and housing of the 20 convicts previously assigned to the former owner, David Maziere. As it took several weeks to obtain meagre supplies from Sydney, self ­ sufficiency was a necessity. This was no easy task as George's diary shows. In 1830 rust caused the loss of 60 of his 70 acres of wheat. In 1831 floods ruined the maize and turnips. Insects ruined the vegetables in the house garden. In December a devastating hailstorm wrecked the tobacco, maize and vegetables. A week later a bushfire destroyed the grass and much of the post and rail fencing. The provision of food for employees was an important responsibility of early colonial employers and was an integral part of the employee's pay. An entry in George's diary in 1833 records the hiring of "Tom, ploughman at five shillings, a quarter pound of tobacco, two ounces of tea, two pounds of sugar, ten pounds of flour and ten pounds of beef per week". Agriculture was the life-blood of the new Colony. Wheat, for flour, and Maize, ground into a meal called hominy or burgoo, were the staple food. Farming in the new Colony was totally different from farming in England. The destruction of crops by flood, fire, hailstorms, insects, animals and aborigines tested George's perseverance. Eventually George successfully grew Indian Hemp (still found growing along the Hunter until quite recently), wheat, maize, mustard, castor oil, millet, barley and tobacco (which can still be seen growing near the house). Innumerable varieties of vegetables and flowers were also grown. In 1830 his diary records that he planted "300 peach, 300 lemon, 2 loquat, 1 olive, 60 fig, 40 quince and pomegranate trees". The trials of farming experienced by George were probably typical of early farmers in the new Colony. Succeeding generations owe them an enormous debt of gratitude for overcoming the problems which experience alone enabled them to master. Agriculture was the foundation of Australia's prosperity and still remains the backbone of our economy. Although George's political views were rather radical by the English standards of the day, favouring religious toleration, passage of the Reform Bills and the abolition of the Corn Laws, he generally stayed clear of politics in the new colony. However, he did support Governor Darling against Wentworth, as well as the `squatters', although never himself occupying land without a licence. Respected for his leniency to his assigned labour in the early days and himself a hard worker in the field, George Wyndham considered himself mainly a farmer and pastoralist. He was highly respected within both the local and wider community. This diary is of considerable historical significance as it is the earliest recorded personal account of vine growing and winemaking under Australian conditions. George's knowledge, gained first hand in Europe, had to be modified to comply with the vastly different conditions in Australia. This trial and error situation gave winemaking a fascination which George clearly enjoyed. The diary is also an interesting record of the weather and the havoc it could cause; George's daily activities; visitors; and, details of the construction of the house. It is a brief but fascinating account of life and death, fire and flood, prosperity and depression - the trials and tribulations of carving out a livelihood in a new country. 1828 - Appointed alternate member of the Legislative Council. 1829 - Appointed Justice of the Peace. 1837 - Elected Chairman of the Bench in Maitland. 1838 - Appointed Trustee of the Maitland Savings Bank. 1842 - Elected Chairman of Maitland Branch of Australian Immigration Association. 1843 - Member of Maitland District Council, the first Local Government body in the Colony. 1867 - Member of Hunter River Vineyard Association.